Today I had a proud Mommy Moment! So I will be bragging on Ethan this time! We received his MPG scoring (standardized thing) and I glanced at it and I thought he wasn't doing as well as he should be. BUT, when I read his "report card" he has all Proficient and Advanced. And for reading, he is reading where they expect him to be at the END of the school year! So hopefully we can work on pushing him so he is farther along by then! Also, at Karate, Sensei Lee & Sensei Anita were discussing a goal for Ethan by this time next year with Brian. They started with...Orange belt for sure. 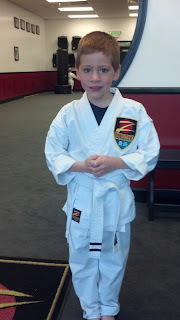 Then it went to, ahh, he can be a purple belt by then! WHAT?!?!?! There is a HUGE list of stuff he has to learn before testing for Orange, then I am sure another big list for Purple?!?!?! BUT if they think he can do it...Here's hoping! That should help in all areas for him! And not to be left out, Nyla is getting along VERY well in her class. She shares and appear so be liked by all. Even though she is the youngest, she seems to be getting it pretty well! Now, to find a gymnastics class since she is out of pull-ups! And Gavin is almost speaking in full sentences now! Plus he can jump and get both feet off the ground! Not far, but hey, he can still jump! If you are here, you likely found us by following the website listed on our Christmas/Holiday cards. So glad you did! The last year has been a whirlwind. 2012 started with my Sister moving back to California. Although we were sad to see her go, we know she is happy back in Sunny California. In February we celebrated Gavin's 1st birthday with so much wonderful Family! He managed to make the obligatory 1st birthday mess! So much so I had to bring him right to the tub after cake time. 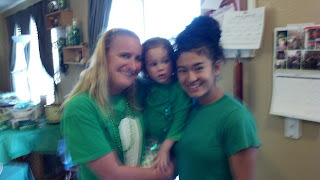 March brought our annual St. Patrick's Day party for which we were blessed with some wonderful weather and great friends. In May, my baby turned 5! How did that happen so soon. We were blessed to celebrate with Brian's Family and my parents and sister who were able to come out. June started out with a crazy Hail storm right after we committed to building out our deck. So it ended up costing us more than anticipated, but we got a roof, a new paint job, and a beautiful new deck! 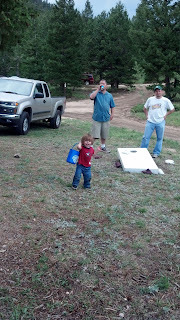 Plus we did get a few great camping trips in before we had to take a hiatus due to a broken truck. Alas, it all worked out great. And Gavin finally decided to start walking!!! Also, some of Brian's family from Indiana came out for a visit so we got to go up Trail Ridge Road and enjoy the beauty of our state with them! July my parents came out for my Mom's family reunion and to throw her a surprise 70th Birthday Party! Mom was surprised and we always love sharing our beautiful state with everyone that comes out. We were able to fit in a quick camping trip with mom & dad and this is the only picture from it! With my brother and parents, we were able to go visit the North Pole in Woodland Park as well! Ethan is still talking about what a good time he had. I think Mike had fun too!! 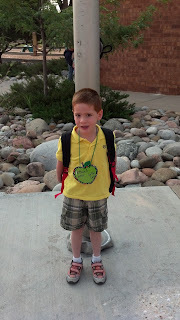 In August, Ethan started Kindergarten! He goes 2.5 days a week (all day Monday & Wednesday & Friday Morning). It is different than most schools that do morning or afternoon. I like the schedule as it gives us a couple days off of doing the school thing. He is really doing well and enjoying school! We have met some wonderful new friends through his school as well!! In August, Nyla got her first haircut! (Gavin had his cut once before this in April or so because he couldn't see anymore!) So I took all 3 kids to get their hair done and this was the best shot I got of them. The other exciting part of August was Nyla started pre-school and Joyful Mission! 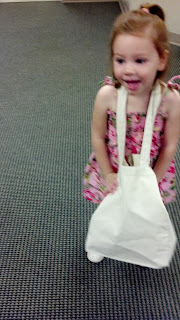 She is one of the youngest in her class, but is loving it! Can't you tell!!!! In October, Nyla turned 3 and we had a ladybug party! Once again, my parents and sister were able to make it out for the festivities! 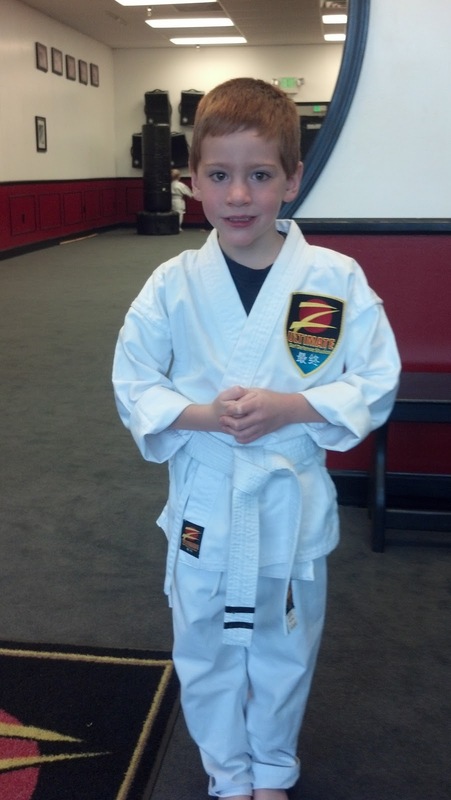 Also, Ethan started Karate and earned his yellow belt in early November! (Okay this was before he got his yellow belt, but still!) He is really enjoying it and has developed some great new skills. Thanksgiving this year was spent in California where we enjoyed beautiful weather as well as visiting Radiator Springs & Disneyland! The kids had a blast!!! So we will be spending Christmas in Colorado with Brian's family. I am still working for NTT America and really enjoying all the opportunities it is giving me to build my HR knowledge and practice skills. Brian is still enjoying being a Stay-At-Home-Dad and working around the house. 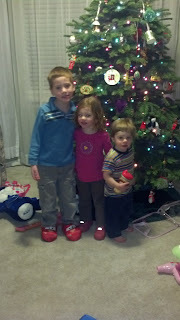 We are finally getting settled in after 2 years here. I wish you all a blessed Christmas, Hanukkah, or any other key holiday in which you celebrate! Many blessings for a wonderful new year!!! 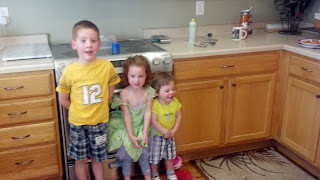 We are trying to keep up our site for our family and friends. We are parents, children, siblings, friends.